A house fire can happen at any time, without warning. You can try to prevent a fire from happening, but you can’t guarantee it. You should be prepared at all times and everyone in your home should know what to do. Practicing fire safety at home could save the lives of your loved ones. Install smoke detectors on every floor and check them monthly. The most important tools for fire safety at home are smoke detectors. There should be at least one installed on every level of the home and inside all bedrooms. 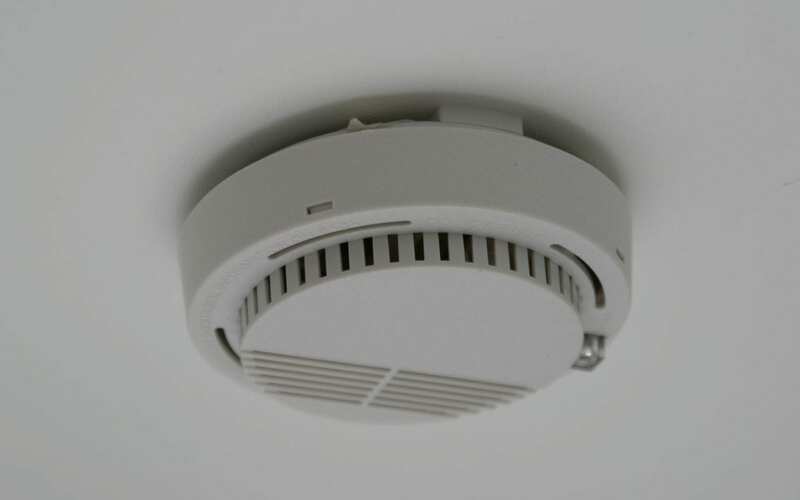 Smoke detectors should be tested every month to make sure their batteries work. Let kids hear what a smoke alarm sounds like and tell them what to do if they hear it. If a child doesn’t know what a smoke detector sounds like, they may not know what it means if it goes off. They should not only know what to listen for, but they should also know what to do if they hear the alarm. In order to have a plan for fire safety at home so that everyone knows how to get out if a fire happens, an escape plan should be created. Once a reliable plan is decided upon, make sure every member of your family is familiar and comfortable with it. Practicing it occasionally is also a good idea. Know two ways to escape from each room. In the event of a house fire, the first escape route may be blocked by smoke or flames. Every person who lives in the home should know a second way to escape from each room. This typically would be through a window. Once outside, do not go back inside the home. This sounds like an obvious tip, but in the heat of the moment, it is sometimes easy to forget. If cherished items were left inside you must still remain outside of the home and wait for the fire department to arrive. While it isn’t foolproof, fire prevention is the best way to keep your family safe. Making sure power cords are in good condition and that outlets are not overloaded. Light bulbs should always be the proper wattage for the fixture they are in, and your home should be equipped with circuit breakers. You should also make sure that light bulbs are never touching any cloth or flammable items. Another major way to prevent fires in your home is to hire an electrician for any electrical projects. Even if you think you’ve done the project correctly, you may have missed something. It is important to be prepared just in case the unthinkable happens. House fires can happen to anyone, so having a plan for fire safety at home can save lives. By following these tips and working to prevent a house fire, you are taking steps to keep your family safe. To learn more about fire safety at home, check out our blog post on grilling safety. Carolina’s Best Home Inspections offers home inspection services to Moore County, NC. Contact us to schedule an appointment or discuss your inspection needs.